For a session boasting highly eminent personalities who represent minorities, the vast number of attendees the session captured made it the majority-attended session of the afternoon. Justice Leila Seth was one of the notable dignitaries present and fans of Asma Jehangir from the US Consulate were not left disappointed either. Unfortunately, Haroon Khalid could not make it. The agenda vehemently focused on the humanitarian treatment of minorities and extension of their rights with a focus on South Asian countries where both India and Pakistan came in for critical appraisal. The session covered a gamut of subjects as each of the panelists took his/her turn on the mike. 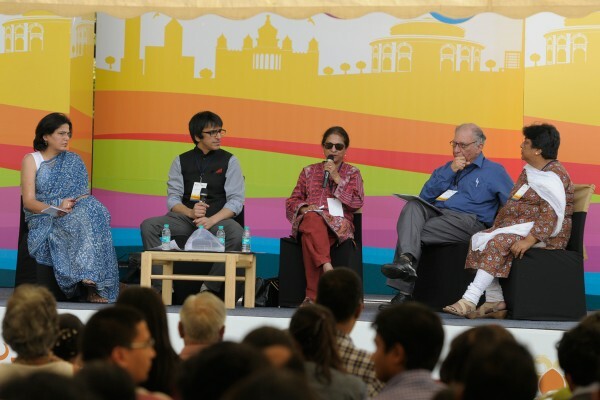 The session started off discussing the anxieties over a right-wing government at the centre in India. Sameer and Rakshanda expressed their unhappiness over the BJP’s unabashed discrimination against minorities although they conceded the Congress was only differentiated by the veneer of pretense. This BJP-bashing was steered in a different direction by Mr.Keki Daruwalla, who visited each riot site in India over the pas three years and introduced the revolutionary concept of Global Citizenship which is spreading worldwide. Daruwalla also stressed the importance of aligning minority rights with nation-building where having the opportunity to work hard would be far more beneficial than providing sops in the form of reservation. Asma Jehangir provided a liberal dose of humour, even as she dealt with serious issues pertaining to Pakistan. Each of her comments was met with applause, especially when she spoke about how her generation had managed to raise the level of respect that was accorded to Muslim women in Pakistan. With delicious irony, Jehangir noted that while Jinnah who was secular in his personal life gave birth to a theocratic nation, Gandhi who was an avid Hindu in his personal life gave birth to a secular democracy. She enraptured the audience with stories of how her father, despite spending 14 years in jail, maintained a level of optimism and transferred it to those who came to visit him. Quizzed about how she managed to be so optimistic about the state of affairs in Pakistan, Asma came to the fore and continued to regale us with stories of her youthful years of freedom-writing. She noted that Pakistan now realizes that a Military regime is unstable and is craving to go democratic. The ‘jazbaa’ that she sees in the youth of Pakistan is what makes her optimistic. Jehangir’s rendition of the transformation Pakistan is going through were inspiring, at the least. Nirupama offered the artist’s view point, detailing the dilemmas of creative people after the riots in Gujarat. She also highlighted the plight of Dalits in Punjab. Her narrative of the Chamars in Punjab along with the development of the Sports Industry there provided an apt example of Mr.Daruwalla’s point on how the opportunity to access good work can bring an end to the minority-majority divide. Audience participation revealed how much attendees agreed with the panelists and appreciated their contributions. The clear takeaway was that legislation linked to religion should be downplayed. One of the observations an attendee brought to the session reflected on how a riot starts as two communities against each other but ends up with the administration fighting against a minority group. Daruwalla believes the reason for this is because the administration is beholden to the majority and therefore must attack the minority to maintain the vote bank. Though divisive politics have been the trend since time immemorial, there is a need for change. Blasphemy laws prevent frank discussions and anti-conversion laws promote riots. These were the gospels attendees could spread after walking away from the session. Perhaps, the world would be a much better place if our writers became politicians!